In February 1923 the Girls’ School head mistress, Ada Aughtie, received a letter from Worcestershire Education Committee which gave instructions for the style of handwriting to be changed for the older pupils. 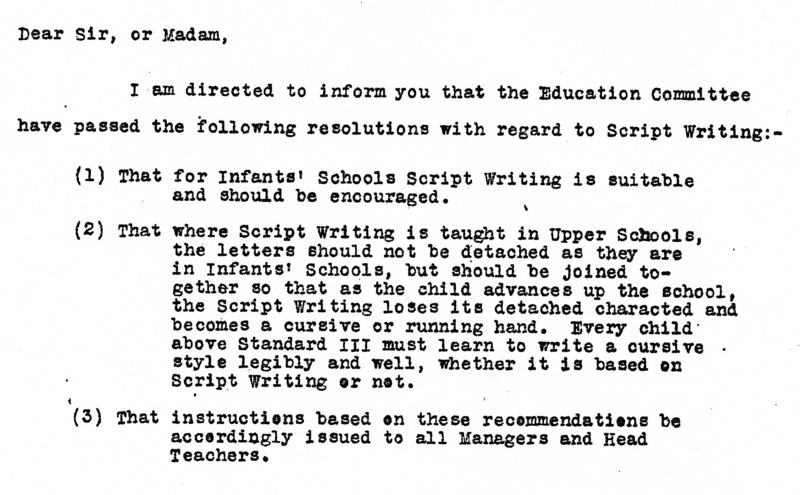 The infants were still to use a script form but the older girls were to be taught a cursive hand, and this was to be a return to a joined-up writing which had been taught previously. It is interesting to see that when Miss Aughtie wrote about this in the log-book she changed her own writing halfway through the paragraph. Previous: This is a copy of an entry in the Girls’ School log-book, dated 1923.